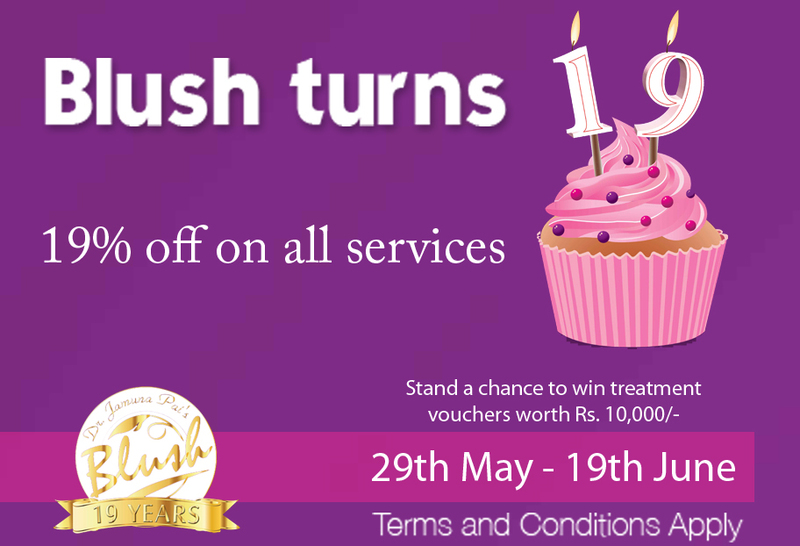 Dr. Jamuna Pai's Blush, India's leading skincare and medical aesthetic clinic celebrates it's 19th Anniversary with 19% off on all Blush Services from the 29th of May - 19th of June. Blush Clinics and it's team of expert doctors and therapists headed by Dr. Jamuna Pai is known for its attention to detail, focus on client satisfaction and as a pioneer of many skincare treatments thus earning them the name tag 'Pioneers of Cosmetology' in India. When asked about Blush's success story, Dr. Pai said, " I was one of the first medical doctors to combine the science of medicine and aesthetics in India. It was always my passion to look good and help others in this quest. I had to travel abroad to learn from leading experts and doctors from around the world. I then came back and put together treatment protocols specifically to treat Indian skin. I started with one small clinic and today we have branches across Mumbai, Pune and are opening our first franchise in New Delhi soon and other cities across India and Asia in the coming months . It is truly a dream come true. I thank all my clients, fellow Blush members and the tremendous support of my family without whom all this would not have been possible." Dr. Pai who also runs a successful training school (DJPIMAC) for doctors wanting to learn the skills and sciences of Medical Cosmetology & Aesthetics from the experts in the field. " India is an emerging beauty market however there is a dearth of trained professionals. Through DJPIMAC i try and teach the participants my experience and skill sets on how to perfect the art of Aesthetic Medicine. We also have in place a grooming and management module which gives the participants a competitive advantage in the field after graduation." DJPIMAC which only caters to medical professionals is soon starting a course for aestheticians to cater to the growing needs of the Indian Beauty Industry. So what's next for Dr. Pai and Blush. "It has been a long journey but there is still a lot to be accomplished. To better cater to clients across the country we are setting up exclusive franchised clinics in New Delhi and other metros across India. We are also in the process of manufacturing our own range of skincare products which will be available exclusively through Blush Clinics. In our endeavor to always be the best we constantly research and update our treatments with new protocols and machines so as to obtain the desired treatment outcome. At Blush our philosophy has always been 'Client Satisfaction' and have never put commercial targets for the clinics or our staff. This differentiates us from most clinics."